1 of 2 Finely crush cookies with food processor. Heat oven to 350 degrees F. In a medium-size bowl, stir melted butter into cookie crumbs until moistened. Press into the bottom and up the sides of a 9-inch deep-dish pie plate. 2 of 2 Bake crust at 350 degrees F for 15 minutes. Transfer to a wire rack and let cool for at least 30 minutes. 1 of 4 Remove ice creams from freezer; soften for 5 minutes. Transfer vanilla ice cream to a bowl; stir until good spreading consistency. Repeat with coffee ice cream. Spread vanilla ice cream into cooled crust and spread level. Sprinkle with coarsely crushed cookie crumbs and spread coffee ice cream over top; spread level. Freeze for 2 hours. 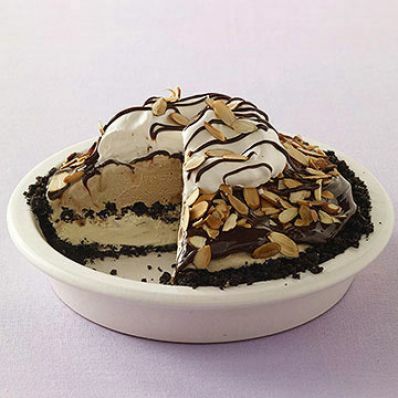 2 of 4 Carefully spread top of pie with fudge sauce; sprinkle with 1/2 cup of the almonds. Cover with plastic wrap and freeze overnight. 3 of 4 Remove pie from freezer. Let stand at room temperature for about 20 minutes before serving. 4 of 4 Meanwhile, whip heavy cream, sugar and vanilla extract on high speed until medium peaks form. Spread whipped cream over pie. Sprinkle with remaining almonds and drizzle with chocolate sauce. Per Serving: 7 g pro., 534 kcal cal., 36 g Fat, total, 47 g carb., 1 g fiber, 276 mg sodium, 18 g sat. fat, 127 mg chol.